The ink-jet recording apparatus has an ink passage into which a water based ink or a preservation solution is filled. The ink passage employs a rubber member formed from a rubber which is formed of a butyl rubber polymer, a rubber polymer vulcanizable with an organic peroxide, and an organic peroxide. The water-based ink has a dynamic surface tension at a lifetime of 100 ms of about 35 mN/m to about 45 mN/m as measured by means of a maximum bubble pressure method at a measurement temperature of 25° C. The preservation solution has a dynamic surface tension at a lifetime of 100 ms of about 30 mN/m to about 35 mN/m as measured by means of the maximum bubble pressure method at a measurement temperature of 25° C.
The present invention relates to an ink-jet recording apparatus in which insoluble materials originating from rubber members employed in an ink passage are prevented from precipitating into a water-based ink or a preservation solution filled into the ink passage. An ink-jet recording apparatus is an apparatus for performing recording by causing ink to adhere to a recording material such as recording paper by means of an ink ejection method such as a thermal method or a piezo method. In the thermal method, ink is rapidly heated to generate bubbles, and fine droplets of the ink are ejected from fine nozzles by utilizing the pressure generated by the rapid heating. In the piezo method, fine droplets of ink are ejected by use of a piezoelectric element. In an ink-jet recording apparatus, rubber members are employed in an ink passage comprised of an ink tank, an ink-jet head and the like. These rubber members include, but are not limited to, a cap which covers nozzles of the ink-jet head, a wiper which cleans the end face of the nozzles of the ink-jet head, a seal packing which is placed at the joint portion between components, and the like. In addition, if the ink tank is provided separately from the ink-jet head, the rubber members also include a tube which supplies ink from the ink tank to the ink-jet head, and the like. However, when the rubber members come in contact with a water-based ink (hereinafter simply referred to as an ink) employed in ink-jet recording or with a preservation solution filled into an ink passage at the time of shipping or during long-term storage, the additives contained in the rubber members are dissolved in the ink or the preservation solution. The dissolved additives then precipitate as an insoluble material, thereby causing a problem such as clogging of nozzles of an ink-jet head. In view of the above, a method has been proposed in US-A1-2005116984. In this method, rubber materials to be employed in an ink passage are immersed in water at 60° C. for a predetermined time in a sealed container for determining the amount of dissolved materials to thereby select suitable rubber materials. However, the amounts and kinds of the insoluble materials precipitating into an ink or a preservation solution depend on the composition of the ink or the preservation solution. Therefore, even when the rubber materials selected by means of the method of US-A1-2005116984 are employed in the rubber members forming the ink passage, the problem of the precipitation of the insoluble materials occasionally arises. Specifically, the problem may arise when the composition of the ink is adjusted such that the ink has a dynamic surface tension preferable for ejection stability and when the composition of the preservation solution is adjusted such that the preservation solution has a dynamic surface tension preferable for replaceability with the ink and wettability. In view of such problems in conventional technology, it is an object of the invention to prevent, in an ink-jet recording apparatus, insoluble materials originating from rubber members employed in an ink passage from precipitating. More specifically, the object is to prevent the insoluble materials from precipitating when an ink is employed which has a dynamic surface tension preferable for ejection stability and when a preservation solution is employed which has a dynamic surface tension preferable for wettability and replaceability with ink. The present inventors have formed rubber members employed in an ink passage of an ink-jet recording apparatus from a rubber in which an organic peroxide is employed as a vulcanization agent and have prepared an ink and a preservation solution so as to have a specific dynamic surface tension. Consequently, the inventors have found that the rubber is prevented from swelling in the ink and the preservation solution and that the precipitation of insoluble materials originating from the rubber members can be significantly suppressed in the ink and the preservation solution. The inventors have also found that ejection stability can be imparted to the ink and that excellent replaceability with ink and excellent wettability can be imparted to the preservation solution. Accordingly, the present invention provides an ink-jet recording apparatus in which a water-based ink or a preservation solution is filled into an ink passage. The ink-jet recording apparatus is characterized in that a rubber member employed in the ink passage is formed from a rubber which is formed of a butyl rubber polymer, a rubber polymer vulcanizable with an organic peroxide, and an organic peroxide, that the water-based ink comprises at least a coloring agent, water and a water-soluble organic solvent, and has a dynamic surface tension at a lifetime of 100 ms of about 35 mN/m to about 45 mN/m as measured by means of a maximum bubble pressure method at a measurement temperature of 25° C., and that the preservation solution comprises at least water and a water-soluble organic solvent, and has a dynamic surface tension at a lifetime of 100 ms of about 30 mN/m to about 35 mN/m as measured by means of the maximum bubble pressure method at a measurement temperature of 25° C.
In the ink-jet recording apparatus of the present invention, the rubber member employed in the ink passage is formed from a rubber formed of a butyl rubber polymer, a rubber polymer vulcanizable with an organic peroxide, and an organic peroxide. In addition, the ink and the preservation solution employed in the ink-jet recording apparatus each have a specific dynamic surface tension. Therefore, even when additives such as a vulcanization agent are dissolved from the rubber, the dissolved state of the additives remains stable in the ink or the preservation solution. Hence, insoluble materials originating from the rubber are prevented from precipitating in the ink and the preservation solution filled into the ink passage. In addition, since the ink has a specific dynamic surface tension, the ink has excellent ejection stability. Furthermore, since the preservation solution has a specific dynamic surface tension, the preservation solution has excellent wettability in the ink passage and excellent replaceability with the ink. The ink-jet recording apparatus of the present invention is characterized in that rubber members employed in part of an ink passage are formed from a rubber which is formed of a butyl rubber polymer, a rubber polymer vulcanizable with an organic peroxide, and an organic peroxide. The ink-jet recording apparatus is also characterized in that the compositions of an ink and a preservation solution employed in the apparatus are adjusted such that the ink and the preservation solution each have a specific dynamic surface tension. The configuration of the ink-jet recording apparatus other than the above features may be the same as that of a known ink-jet recording apparatus. No limitation is imposed on an ink ejection method, and a thermal method, a piezo method or any other method may be employed. In the ink-jet recording apparatus, the rubber members employed in a part of the ink passage include, but are not limited to, a cap which covers nozzles of an ink-jet head, a wiper which cleans the end face of the nozzles of the ink-jet head, and the like. In addition, if an ink tank is provided separately from the ink-jet head, the rubber members also include a tube which supplies ink from the ink tank to the ink-jet head. Further, the rubber members also include a seal packing which is an elastic member held between a buffer tank and a head unit, as disclosed in Japanese Patent Application No. 2004-207208. The butyl rubber polymer, which can form the rubber members, refers to an uncrosslinked isoprene-isobutylene rubber polymer obtained by copolymerizing isoprene and isobutylene and also refers to a compound obtained by substituting a part thereof with a halogen. When a rubber base polymer is formed of such an isoprene-isobutylene rubber polymer alone, the rubber base polymer is not easily vulcanized with an organic peroxide only. Examples of the rubber polymer vulcanizable with an organic peroxide include, but are not limited to, an ethylene-α-olefin rubber polymer, a styrene-butadiene rubber polymer, an isoprene rubber polymer, a butadiene rubber polymer, a nitrile-butadiene rubber polymer, a chloroprene rubber polymer and the like. 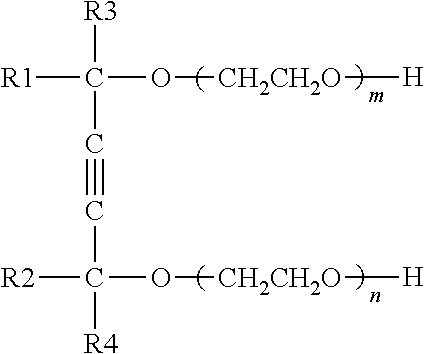 Here, the ethylene-α-olefin rubber polymer refers to a copolymer of ethylene and an α-olefin or a copolymer of ethylene, an α-olefin and a nonconjugated diene. Examples of the α-olefin include, but are not limited to, propylene, 1-butene, 1-pentene, 1-hexene and the like. Examples of the nonconjugated diene include, but are not limited to, 5-methylene-2-norbornene, 5-ethylidene-2-norbornene, dicyclopentadiene, 1,4-hexadiene and the like, and derivatives thereof. A commercial product such as EP331 (product of JSR Corporation) or ESPRENE (registered trademark) 505 (product of SUMITOMO CHEMICAL CO., Ltd.) may be employed as the vulcanizable rubber polymer with an organic peroxide. Of these rubber polymers vulcanizable with an organic peroxide, an ethylene-propylene-5-ethylidene-2-norbornene rubber polymer, an ethylene-1-butene-1,4-hexadiene rubber polymer and the like are preferable since the crosslinking reaction proceeds easily to increase the crosslinking density. The mixing ratio of the butyl rubber polymer to the rubber polymer vulcanizable with an organic peroxide is preferably about 40/60 to about 95/5 in weight ratio. When this ratio is less than about 40/60, the vulcanization of the rubber polymer vulcanizable with an organic peroxide proceeds excessively. Hence, the rubber exhibits poor flexibility and is no longer suitable for the rubber members employed in the ink passage of the ink-jet recording apparatus. On the contrary, when this ratio is larger than about 95/5, the vulcanization is less likely to proceed over the entire rubber. Examples of the organic peroxide as the vulcanization agent for the above rubber polymer include, but are not limited to, diacyl peroxides, dialkyl peroxides, peroxyesters, peroxyketals and the like. These may be employed alone or as a mixture thereof. Specific examples of the organic peroxide include, but are not limited to, dibenzoyl peroxide, 1,1-bis(tert-butylperoxy)-3,3,5-trimethylcyclohexane, 1,1-bis(tert-butylperoxy) cyclododecane, n-butyl-4,4-bis(tert-butylperoxy) valerate, dicumyl peroxide, tert-butylperoxybenzoate, bis(tert-butylperoxide), bis(tert-butylperoxy) diisopropylbenzene, 2,5-dimethyl-2,5-bis(tert-butylperoxy) hexane, 2,5-dimethyl-2,5-bis(tert-butylperoxy) hexyne-3, tert-butylperoxycumene and the like. The preferred mixing amount of the organic peroxide with respect to the total amount of the butyl rubber polymer and the rubber polymer vulcanizable with the organic peroxide is preferably about 0.5 wt. % to about 10 wt. %. When the mixing amount of the organic peroxide is too low, the tensile strength is lowered. When the mixing amount is too high, the tensile strength becomes lowered, and the hardness also becomes lowered. Various additives may be added to the rubber composition in accordance with need. Examples of such additives include, but are not limited to: fillers such as carbon black, calcium carbonate and silicon dioxide; softening agents such as paraffin oil; antioxidants; scorch retarders; and the like. However, in terms of preventing precipitation of insoluble materials in the ink or the preservation solution, preferably, a vulcanization accelerator for regulating the vulcanization rate or the vulcanization density is not added. In a method of manufacturing the rubber members from the above rubber composition, kneading is performed by means of a kneading apparatus such as a Banbury mixer, a kneader or a twin roll mill. Further, heating is carried out normally at about 150° C. to about 200° C. for about 5 minutes to about 15 minutes in a vulcanization step for the rubber. Preferably, an ink which comes in contact with the above-mentioned rubber members in the ink passage in the ink-jet recording apparatus comprises at least a coloring agent, water and a water-soluble organic solvent. In addition, the ink preferably has a dynamic surface tension at a lifetime of 100 ms of about 35 mN/m to about 45 mN/m as determined by a maximum bubble pressure method at a measurement temperature of 25° C.
By setting the dynamic surface tension at a lifetime of 100 ms as determined by the maximum bubble pressure method at a measurement temperature of 25° C. to about 35 mN/m to about 45 mN/m, ejection stability from an ink-jet head can be imparted to the ink. In addition, even when an organic peroxide dissolves into the ink, precipitation thereof can be prevented. If the dynamic surface tension is less than about 35 mN/m, a desirable meniscus is not formed at a nozzle of an ink-jet head, thereby causing difficulty in ejecting the ink as fine droplets. Moreover, the wettability of the ink to a recording material such as paper becomes excessively high, causing deterioration of print quality. On the contrary, if the dynamic surface tension exceeds about 45 mN/m, difficulty arises in introducing the ink into an ink-jet head, thereby causing a problem that the ink is not ejected as well as precipitation of an organic peroxide. It has been known that the dynamic surface tension is generally determined by an oscillating jet method, a meniscus method, the maximum bubble pressure method or other method. However, the value of the dynamic surface tension defined in the present invention is determined by means of the maximum bubble pressure method. wherein r is the radius of the end portion of the probe, and ΔP is the difference between the maximum pressure and the minimum pressure on the bubble. The term “lifetime” refers to a period of time from when a bubble is separated from the probe after the pressure reaches the maximum bubble pressure to form a new surface to when the pressure again reaches the maximum bubble pressure. The mixing composition of water and the water-soluble organic solvent comprised of the ink is adjusted such that the above-mentioned condition for the dynamic surface tension is satisfied. Specifically, a glycol ether is preferably employed as the water-soluble organic solvent. A glycol ether reduces the dynamic surface tension, moderately enhances the penetration rate of ink into a recording material such as paper, and improves the drying characteristics. Specific examples of the glycol ether include, but are not limited to, diethylene glycol methyl ether, diethylene glycol butyl ether, diethylene glycol isobutyl ether, dipropylene glycol methyl ether, dipropylene glycol propyl ether, dipropylene glycol isopropyl ether, dipropylene glycol butyl ether, triethylene glycol methyl ether, triethylene glycol butyl ether, tripropylene glycol methyl ether, tripropylene glycol butyl ether and the like. Of these, triethylene glycol butyl ether, dipropylene glycol propyl ether and the like are preferable since they are excellent in the capability of adjusting the dynamic surface tension and in print quality. These may be employed alone or as a mixture of two or more. The amount of the glycol ether with respect to the total weight of the ink is preferably about 0.7 wt. % to about 10 wt. %, and more preferably about 3 wt. % to about 7 wt. %. Disadvantageously, if the amount of the glycol ether is too low, the dynamic surface tension becomes excessively high, and thus difficulty arises in introducing the ink into an ink-jet head. In addition, the penetration rate of the ink into a recording material is lowered, thereby causing problems in drying time and bleeding. On the contrary, disadvantageously, if the amount of the glycol ether is too high, the dynamic surface tension becomes excessively low. Thus, a desirable meniscus cannot be formed at a nozzle of an ink-jet head, and swelling occurs in the rubber members. In addition, since the ink excessively penetrates into a recording material, the ink reaches the back surface of the recording material, and blurring occurs considerably. As the water-soluble organic solvent, a humectant for preventing drying of the ink at a nozzle and for improving the solution stability of the ink may be optionally added in addition to the glycol ether. Specific examples of the humectant include, but are not limited to: polyhydric alcohols such as ethylene glycol, propylene glycol, diethylene glycol, triethylene glycol, dipropylene glycol, polyethylene glycol, polypropylene glycol, 1,3-butanediol, 1,5-pentandiol, 1,6-hexanediol, glycerin, 1,2,6-hexanetriol, 1,2,4-butanetriol, 1,2,3-butanetriol and the like; nitrogen-containing heterocyclic compounds such as N-methyl-2-pyrrolidone, N-hydroxyethyl-2-pyrrolidone, 2-pyrrolidone, 1,3-dimethylimidazolidinone, ε-caprolactam and the like; amides such as formamide, N-methylformamide, N,N-dimethylformamide and the like; amines such as ethanolamine, diethanolamine, triethanolamine, ethylamine, diethylamine, triethylamine and the like; sulfur-containing compounds such as dimethyl sulfoxide, sulfolane, thiodiethanol and the like; and the like. These may be employed alone or as a mixture of two or more. The amount of the humectant depends on the composition of the ink and the desired characteristics of the ink and is determined over a wide range. Normally, the amount of the humectant with respect to the total weight of each ink is preferably about 0 wt. % to about 40 wt. %, and more preferably about 0 wt. % to about 30 wt. %. The amount exceeding about 40 wt. % is not preferable since the viscosity of the ink unnecessarily increases to potentially cause problems such as difficulty in ejecting the ink from a nozzle of an ink-jet head and significant retardation of drying on a recording material. Further, a monohydric alcohol such as ethanol or isopropyl alcohol may be employed for the purpose of controlling the penetrability of the ink into a recording material and the drying characteristics of the ink. In order to prevent clogging of a nozzle, an ink filter and the like caused by impurities contained in water, the water employed in the ink is not ordinary tap water but preferably high purity water such as ion-exchanged water, distilled water or ultrapure water. The amount of the water with respect to the total weight of the ink is preferably about 10 wt. % to about 98 wt. %, more preferably about 30 wt. % to about 97 wt. %, and most preferably about 40 wt. % to about 95 wt. %. As the coloring agent, water-soluble dyes typified by direct dyes, acid dyes, basic dyes, reactive dyes and the like may be employed, and various inorganic pigments and organic pigments may also be employed. In addition, a self-dispersing type pigment may be employed which is obtained by subjecting a pigment to a surface treatment. wherein R is an alkyl group having 12 to 15 carbon atoms, n is 2 to 4, and M is Na or triethanolamine. Examples of the surfactant which is commercially available include, but are not limited to: SUNNOL (a registered trademark) NL-1430, LMT-1430 and DM-1470 (products of LION Corporation); EMAL (a registered trademark) 20C, 20CM and 20T (products of Kao Corporation); SANDET (a registered trademark) EN, ET and END (products of Sanyo Chemical Industries, Ltd.); and the like. Moreover, if the ink is applied to an ink-jet printer of a thermal type utilizing the action of thermal energy to eject the ink, an additive for adjusting thermal physical properties such as specific heat, thermal expansion coefficient and thermal conductivity may be employed. In a conventional ink-jet recording apparatus, the ink having a dynamic surface tension of about 35 mN/m to about 45 mN/m adjusted by use of the above-mentioned components causes the precipitation of insoluble materials originating from the vulcanization agent into the ink. This results in that an ink filter is clogged and the ink is not ejected from a nozzle of an ink-jet head. However, in the ink-jet recording apparatus of the present invention, such problems are solved. The preservation solution employed in the ink-jet recording apparatus of the present invention is prepared from the water and the water-soluble organic solvents such as the glycol ether, which are the same as those in the above-mentioned ink. However, the coloring agent may be omitted. Here, preferably, the dynamic surface tension at a lifetime of 100 ms as determined by the maximum bubble pressure method at a measurement temperature of 25° C. is adjusted to about 30 mN/m to about 35 mN/m. If this dynamic surface tension is less than about 30 mN/m, the wettability of the preservation solution to the rubber members becomes excessively high, and the penetrability also becomes excessively high, thereby causing a problem of swelling of the rubber members. On the contrary, if the dynamic surface tension exceeds about 35 mN/m, the preservation solution cannot be smoothly replaced with ink at the time of initial introduction of the ink into an ink-jet head. wherein the sum of m and n is 0 to 50, and R1, R2, R3 and R4 are independently an alkyl group. Examples of the surfactant which is commercially available include, but are not limited to, OLFINE (a registered trademark) E1010 and E1004, SURFYNOL (a registered trademark) 104E (products of Nissin Chemical Industry Co., Ltd.) and the like. The present invention will next be specifically described by way of examples. The compositions shown in Table 1 were employed for the inks and the preservation solutions, and all the components were stirred and mixed to obtain inks 1 to 4 and preservation solutions 1 to 3. In the ink compositions shown in Table 1, the actual mixing amount of each of the components is listed in weight percent (wt. %). The dynamic surface tension of each of the inks and each of the preservation solutions was measured by means of the maximum bubble pressure method at a lifetime of 20 ms to 5,000 ms and at a measurement temperature of 25° C. by use of an automatic dynamic surface tension meter (BP-D4, product of Kyowa Interface Science Co., LTD.). Then, the measurement value of the dynamic surface tension at a lifetime of 100 ms was read. The results are shown in Table 1. According to each of the rubber composition shown in Table 2, the components were successively fed to a rubber mixer, were kneaded, and were then discharged therefrom. The discharged mixture was extruded into a sheet-like shape by means of a biaxial extruder and then was subjected to vulcanization molding (at 170° C. for 10 minutes) to thereby obtain rubber sheets 1 to 10 for evaluation. Each of the rubber sheets prepared in (3) was cut to dimensions of 50 mm length, 10 mm width and 2 mm thickness to form a sample for evaluation. According to the combinations of experimental examples A-1 to A-24 and B-1 to B-18 shown in Tables 3 and 4, each of the above-mentioned samples was immersed into 10 mL of the ink or the preservation solution in a sealed container and was left to stand for two weeks in a thermostatic bath at 60° C. Thereafter, the immersed sample was removed. For each case, the ink or the preservation solution after the removal of the immersed sample was filtrated with an electroformed filter (a pore size of 13 μm and an effective filtration area of 8 cm2) to measure the time required for the filtration. In addition, as a control, the inks and the preservation solutions to which the sample was not added were left to stand under the same conditions as above (at 60° C. for two weeks) and were filtrated with an electroformed filter having the same specification as above to determine the time required for the filtration (the reference time). For each of the inks and each of the preservation solutions into which the sample was immersed, the ratio of the time required for the filtration to the reference time was determined and evaluated by the following criteria. The results are shown in Tables 3 and 4. AA: the required filtration time is less than 130% of the reference time. A: the required filtration time is at least 130% and less than 200% of the reference time. B: the required filtration time is at least 200% and less than 400% of the reference time. C: the required filtration time is at least 400% of the reference time. The electroformed filters after the filtration were observed under a microscope, and it was found that the larger the ratio of the above-mentioned filtration time to the reference time, the more the amount of the precipitates. For each of the rubber samples immersed into the ink or the preservation solution (at 60° C. for two weeks) in (4), the weight was measured before and after the immersion, and the weight change ratio was evaluated by the following criteria. The results are shown in Tables 3 and 4. A: The weight change ratio is 0% to 5%. B: The weight change ratio is less than 0% or exceeds 5%. A weight change ratio of less than 0% means that the rubber is dissolved in the ink or the preservation solution. Further, a weight change ratio exceeding 5% means that the rubber is overswelled. For both the cases, ejection failure is likely to occur in actual use. *1Acetylene glycol-based surfactant; product of Nissin Chemical Industry Co., Ltd.
*3Mildewproofing agent; product of Arch Chemicals, Inc.
As can be seen from the results in Tables 3 and 4, for the rubber samples 4 to 6 in which zinc oxide was employed as the vulcanization agent but the organic peroxide was not employed, the precipitation evaluation results were unfavorable in all the inks and preservation solutions. On the other hand, for the rubber samples 1 to 3 in which the organic peroxide was employed and zinc oxide and the vulcanization accelerator were not employed, the precipitation evaluation results were excellent in the inks 1 to 3 and the preservation solutions 1 to 3. However, since the ink 4 has a dynamic surface tension of 45 mN/m or more, insoluble materials were precipitated for the rubber samples 1 to 3. The preservation solution 3 comprises a large amount of the glycol ether, and the dynamic surface tension is less than 30 mN/m. Therefore, since the wettability and also the penetrability become excessively high, the rubber sample swells, resulting in poor weight change evaluation results. The present invention is useful as an inkjet recording apparatus which does not suffer performance deterioration due to precipitates with an ink or a preservation solution filled therein. The entire disclosure of the specification, claims and summary of Japanese Patent Application No. 2005-232318 filed on Aug. 10, 2005 is hereby incorporated by reference. wherein the preservation solution includes at least water and a water-soluble organic solvent, and has a dynamic surface tension at a lifetime of 100 ms of about 30 mN/m to about 35 mN/m as measured by means of the maximum bubble pressure method at a measurement temperature of 25° C.
a mixing ratio of the butyl rubber polymer to the rubber polymer vulcanizable with an organic peroxide in the rubber member is about 40/60 to about 95/5 in weight ratio. the water-based ink comprises glycol ether as a water-soluble organic solvent in an amount of about 0.7 wt. % to about 10 wt. % with respect to the total weight of the water-based ink. wherein R is an alkyl group having 12 to 15 carbon atoms, n is 2 to 4, and M is Na or triethanolamine. the preservation solution does not contain any coloring agent. the preservation solution comprises glycol ether as a water-soluble organic solvent in an amount of about 3 wt. % to about 10 wt. % with respect to the total weight of the preservation solution. wherein R1, R2, R3 and R4 are independently an alkyl group, and the sum of m and n is 0 to 50. First Office Action dated Aug. 11, 2010 for corresponding Japanese Patent Application No. 2005-232318 and its English translation.